Oh dear. Oh dear oh dear oh dear. On the advice of a commenter on the blog recently – thanks Mike! 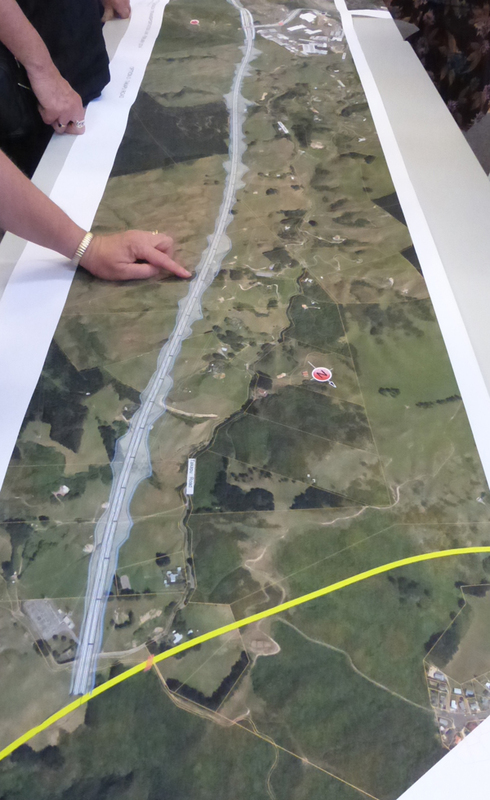 I went out with a couple of the other Fish, to the NZTA “open day” at Tawa / Linden, to see what they were presenting. First up, I’ve gotta say, good on them for fronting up and having the discussions. Better to have discussions now, rather than leave it till it is all too late, as seems to have happened with the flyover at the Basin. There, they did all their work, and then presented the public with a fait accompli, of a “choice” of two flyovers. Take one, or the other, or – heck, why not take both! (if you believe the conspiracy theorists, we’ll get the other one in a few years anyway, and they may well be right). But take no notice what the public said they would want, which was a tunnel. It’s like that hoary old joke about showing the Irishman two shovels and telling him to take his pick. Confuses the heck out of people. Here, at the link road end of the Transmission Gully, they’ve also done lots of work, and are presenting more than just two options. In fact, they’ve got options coming out of their ears. There’s an Option A, Option B, Option C, or Option D, all at one end, and options 1, 2, 3, and 4 at the other end. They join together at a magic joining line in the middle, roughly where that new airport was being proposed only a week or two ago. I’m not sure whether that was a sign that Richard Burrell was right on the mark, in terms of being in the middle of it all; or just incredibly bad timing and a serious waste of energy for the worst site suggestion ever. Time to think again on Options A, B, C, and D as well. NZTA have, again, very helpfully already deleted options A and B already, and quite rightly too, because they really were monumentally bad plans. Perhaps the junior in the office was given the chance to colour those ones in with a crayon. Option A looks like it just hives off into the undergrowth for a pee, and then gets set upon by hunting dogs: shits itself and dies. Nasty. It doesn’t even make it as far as the connection with the existing State Highhway 1, which I would have thought would be at least a basic pre-requisite for a “link road”, but apparently I must be wrong. Option B seems a lot more logical, but for some reason that I haven’t discovered yet, has also been deleted from the box of choices. We are left with option C, which must have made sense to someone somehow somewhere along the way, doing a mad double back manoeuvre at Tawa / Grenada North (can’t we change that stupid name – Grenada just reminds me of Coronation Street), and e crowd left the planners and traffic engineers in no uncertain terms that it was a retarded scheme made by clueless numpties. I honestly thought that some of the people were going to start throwing punches. 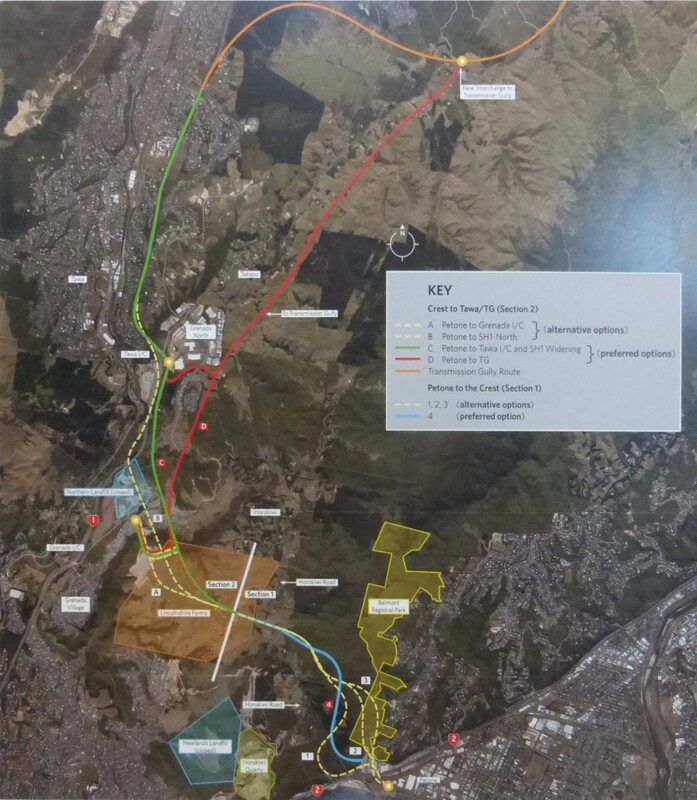 And then there is option D, the proposed route up through Takapu valley. Actually, that’s not exactly true really – while it would tend to definitely bugger the valley, it is not at the bottom as Gloria had thought it might be, but it is proposed halfway up the hill on the southern side of the valley. Photos to follow when I get the film back from the printer (damn, can’t use that excuse any more…), but the local rebels weren’t having a bar of it. Their view was absolutely positively that it would destroy one of the last untouched pieces of human-created paradises on the planet. Heritage status was invoked. Potential Site of Specific Scientific Interest was muttered. Last of the untouched world was hinted at. First of the Federation Farms was expressed, although I’m really not sure what that was about. But apparently it means the farms there are very old. Exactly how that differs from other farms, which are also very old, I’m not too sure. So, the choices are then: umm, none really. Only one option at Petone, and either a choice of option C (which only links Petone to Tawa), or option D (which officially links Petone to Transmission Gully, with just a small silly wiggly intersection road to link back to Tawa). Honestly – its not working guys. Something else needs to be done. The answers you have presented are not the answers that we want. These are not the droids you are looking for. The options are not an option. The alternative is a different alternative. I’ll do some work and come up with some real options later, but for now, as far as I can see, NZTA need to be told very firmly to: go back to the drawing board. Of interest, in a vaguely non-interesting manner, was that there is a vast Scoping Report, produced in Feb 2014 (ooh, that’s now! ), and apparently now available somewhere on their website. Also that most of the design work is being done by Opus, yet again, and that Dr Wayne Stewart (yes, he of the perpetual grilling session at the Basin Bridge Board of Enquiry on now) was the author of the report. My slightly cynical guess is that after today’s session on the BoI stand, he will be making damn sure that he has dotted all his i and crossed all his t the next time he has to write a report. The real clincher for me was one man with a little girl, only about 7, and as her Dad said, “look, even a 7 year old can show you a better route for that road” and she proceeded to do so. Really, really basic mistakes that just rile the audience up against you seem to be a stock in trade of this design crew. Why show a plan that has got existing grass and hill on one side of a major road, and a row of houses on the other side of that road, and then show the houses wiped out and the grass remaining intact? Surely, surely, as a hundred rather angry people said, surely it doesn’t take much brain to figure out that slicing off the other side of the street would work better for all? Anyway – a good feedback session was had, and hopefully, some lessons learnt by Opus and NZTA, prime amongst them being: please think again. I find it curious that Option B has already been discounted, as it seems the most obviously sane choice to me. 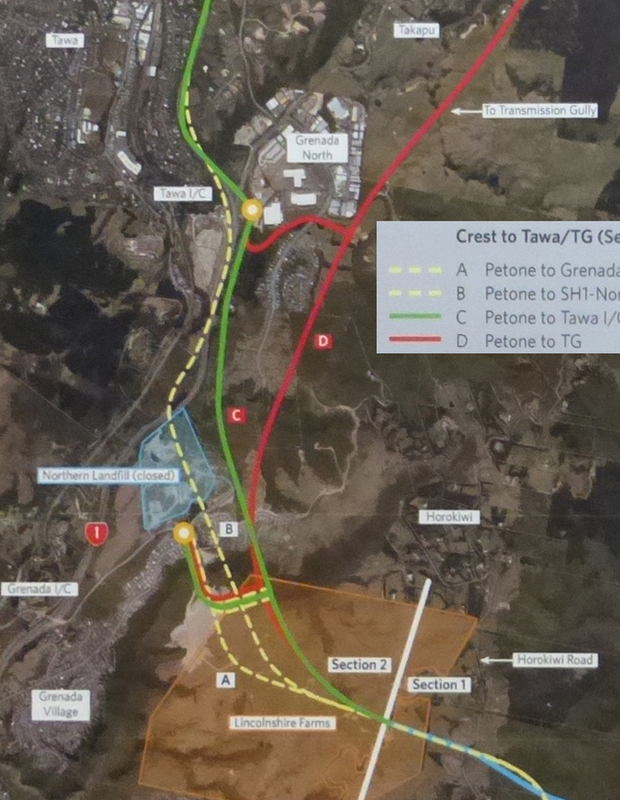 The proposed connection point is midway between Grenada and Grenada North, which is a logical move, and it doesn’t involve the long doubling up of highway of Option C, nor the politically unpalatable option D through Takapu Valley. What were their reasons for dismissing it, do you know? Alan – not sure, as I haven’t read the Scoping Report yet. But NZTA are calling for submissions, with a date of the end of March, so plenty of time to read and put in a submission in paper or on-line. Curiously little comment here today, perhaps the discussion is all already happening in the homes of the people of the Takapu valley…. Is this road really necessary? I was caught in peak hour traffic in Petone recently, and it was Petone Esplanade that was gridlocked, not SH2 to Ngauranga Gorge. You’ve got commuters coming and going from Eastbourne, Wainui, Petone, plus trucks to and from Seaview that are still going to have to use the Esplanade..
Also it looks like they’re going to have cut away half the Horokiwi hillside to climb 100 metres and quite quickly from the Petone side, not cheap or easy. Sav – the climb out of Petone, as you say, will be neither cheap nor easy. 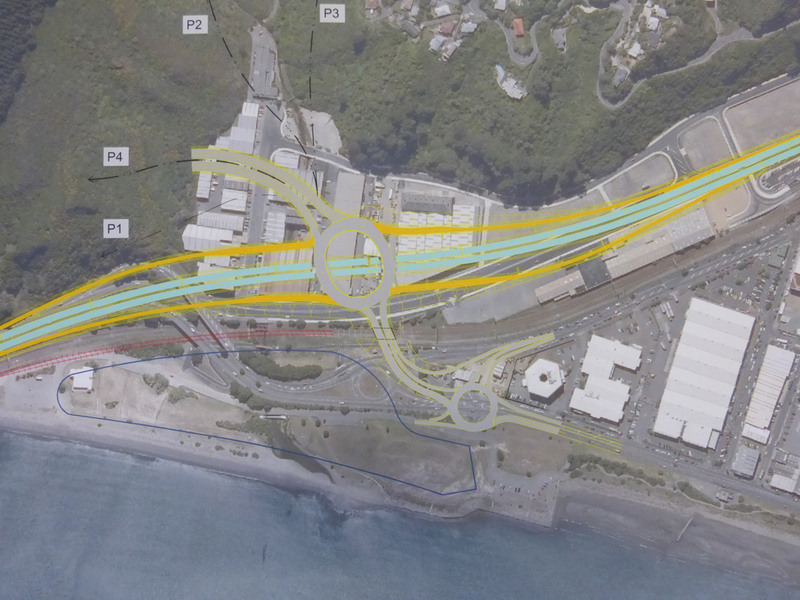 It will be about the same length as the Ngauranga Gorge but 10% steeper, with cuttings 60-70m deep. 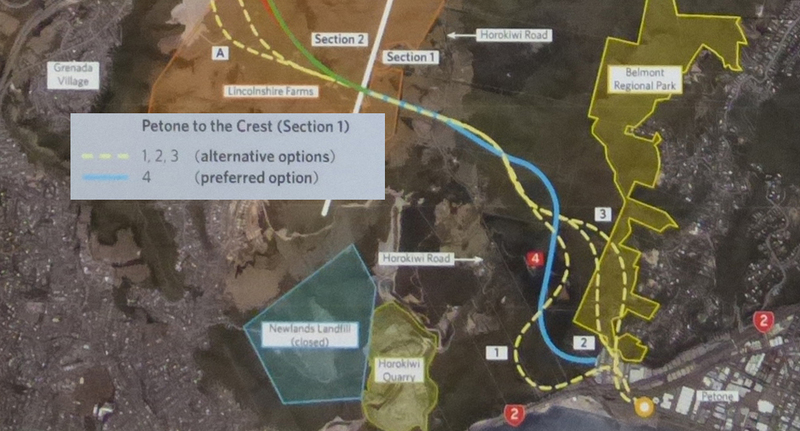 The amount of spoil produced will be enormous – hence the desire to link it with the Petone-Ngauranga walkway, which will eat some (but by no means all) of it up. I thought this road had been on the plans for quite some time? I never understood why TGM (as much as I’m opposed to it) didn’t run straight down Takapu Valley to merge with existing SH1, with a link road to Porirua and down to Petone instead. Seems more direct. That said. How absolutely ridiculous has transport planning gotten in Wellington region. Now in the paper today a massively messed up BRT design is the great leap forward for Wellington. That’s depressing. Petone Seafront is a grind, so will the 9%, 290m!! climb up the Petone cutting and then down again on the exhaust brakes – and you still haven’t gone north yet! Truckers from Petone/Seaview will join SH2 a bit further north – avoiding the seafront, head up the flat SH2,and then SH58 5.8% climb only 122m to join the TG at Judgeford. NZTA have got to accept, whether they like it or not, that this will be the road of choice. This is made easier because the main arterial has moved east. Distance is about the same from Petone – so by definition, everything north of here – which is everything – has a shorter journey. Net result, less traffic at Tawa – no need for option ‘C’ (widen SH1) or ‘D’ (bomb Takapu Valley). 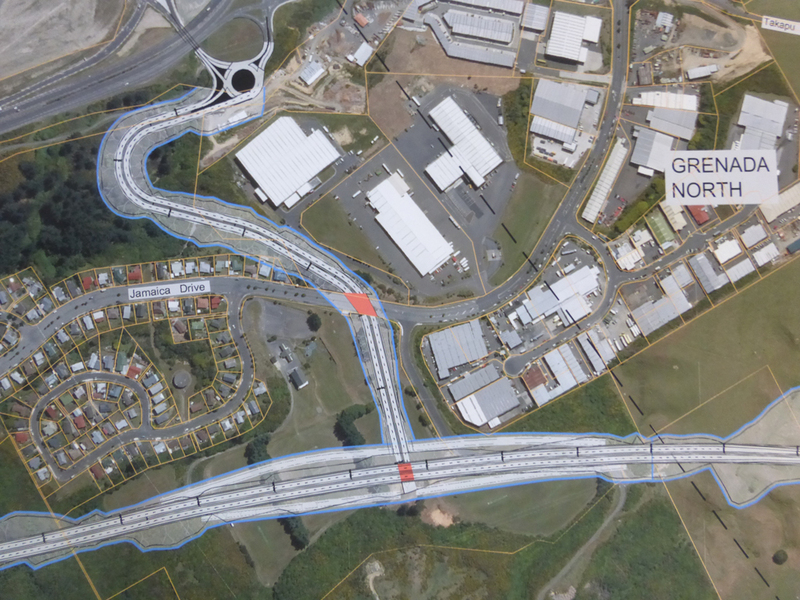 It’s easy, if Petone to Grenada goes ahead – connect it at Grenada, connect TG at Linden. What was SH1 @ Linden, is really only local traffic coming in from Porirua – the long haul stuff is on TG. It will work, no loss of houses. QED. I would have thought the money used for Takapu Valley could be better used in ensuring Ngaranga Gorge was safe during an earth quake. I would hate to wonder what would happen if a descent earthquake struck during peak hour traffic and a massive slip ended up on the traffic. The majority of building owners now have to ensure their buildings are earthquake proof. There is now a major enquiry to the collapse of a building in Canterbury. LTSA are obviously aware of this problem and I would like know what they done to minamise this risk. The key to it all is improving SH58 for the 6km or so from Judgeford to SH2. The money saved by not building a 6.5km road through Takapu Valley would surely pay for it’s improvements and a proper junction with SH2. I believe it and taking out the traffic lights is earmarked anyway. SH58 is your resilience. 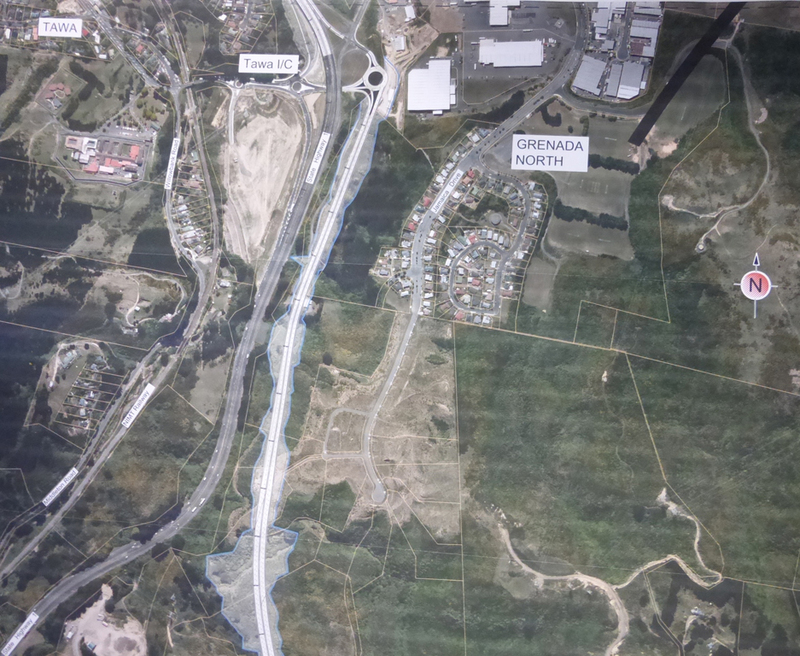 Petone to Grenada also has a resilience argument and would prevent a lot of the issues at the bottom of the Gorge. It’s use is really only for people in Tawa, J,ville & Grenada – everyone else has a more direct route. It does add resilience – but at hell of a cost. It begs the question though – would a tunnel be a better solution? If they have to move all that over-burden rock above, just to get down to a level they can put a road through…? The engineers didn’t even know that Wellington’s primary water and gas mains aleady ran down the valley and they’d laid a new motorway over them? People need to realise that they themselves choose to live in areas that are affected by traffic and that would be reflected in the cost of their homes. I’m sure the people in Takapu Valley have chosen to live in a quiet area away from the traffic and would have paid a little extra for their properties.